Are your valuable resources consumed by day-to-day operational responsibilities? Do you feel that there's no time left to take on more strategic projects? Or, do you feel that your team may lack a bit of the expertise needed to support today's rapidly evolving technologies that your business relies on? If you said yes to any of these questions, then the ShorePatrol Technical Concierge Service can help. Operate Services—Maintain the health and availability of critical business systems and applications. Optimize Services—Improve mission-critical systems that increase business value. ShorePatrol Technical Concierge Service also offers a close-knit relationship with expert ShoreGroup engineers. They not only understand your team, business, and goals but are available 24x7. 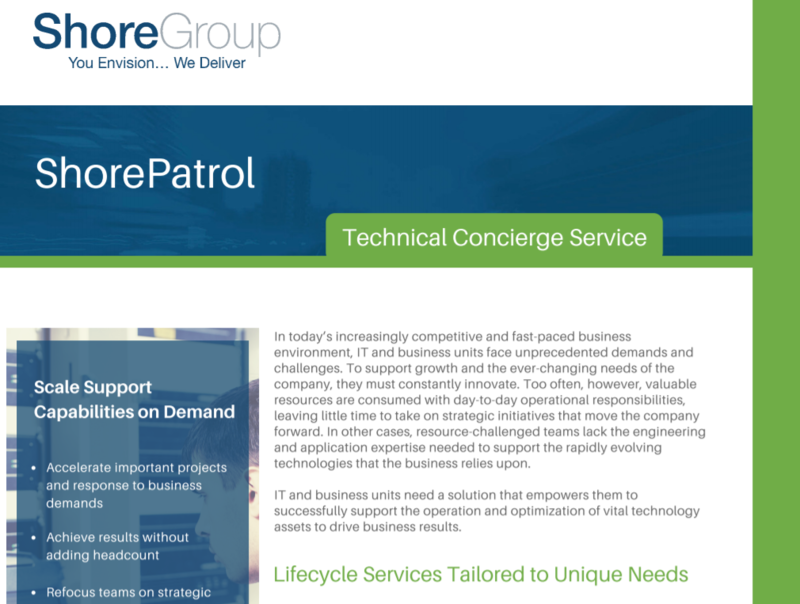 Read the ShorePatrol Technical Concierge Service datasheet to learn more.